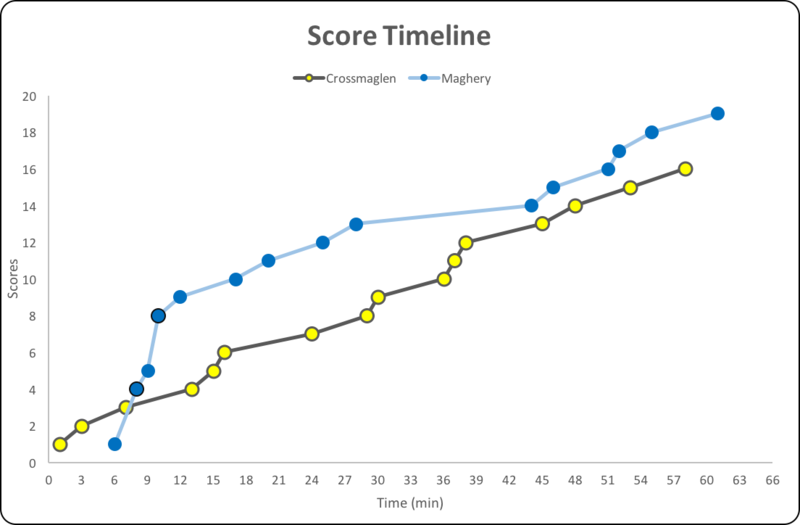 After a titanic battle against Crossmaglen, Maghery held on by 3 points to continue their search for a second championship title in as many seasons. The game was both physical and enthralling throughout with Maghery edging into the final on a score line of 2-13 to 0-16. Two first half goals helping them on their way. Crossmaglen opened the scoring straight from the throw in. Paul Hughes who starting in the half forward line to man mark Maghery’s Stephen Cusack set up Padraig Stuttard who kicked the ball between the posts. Cross got their second soon after when Rian O’Neill drove over a point after winning the Maghery kickout. Maghery responded 2 minutes later when Stefan Forker converted a free, following good work from Stephen Cusack who forced a turnover in the middle of the field. Crossmaglen were able to stretch their lead within 60 seconds as Aaron Kernan stroked over a free kick. 3 shots, 3 scores for Cross. Maghery answered back in heroic fashion. A high ball sent into the full forward line by Cusack punched to the net by Ronan Lappin, to leave Maghery a point to the good. This lead was soon extended when the inspirational Cusack was sent through on goal by Conor Mackle, to rattle the ball into the corner of the Crossmaglen net. Ben Crealey working hard to win the initial break ball in centre field. Maghery’s dominance continued when Ciaran Higgins broke forward from the half back line to swing the ball over the bar and put his side 6 points ahead. The score board now reading Maghery 2-3 Crossmaglen 0-3. Maghery controlling the affair having scored 2-2 in a 5-minute spell. Rian O’Neill became more prominent as Cross tried to haul themselves back in contention, notching 2 points. While also gaining possession in the middle of the field to set up brother Oisin who was fouled. Aaron Kernan popping the ball over the bar from the dead ball. This left 3 between the sides with Cross being extremely efficient to get back into the game having an 86% shot accuracy. Maghery’s ability to retain their own kickouts launched their next 2 attacks. Cusack and James Lavery both working hard to collect the break ball and set up the Forker brothers, Stefan and Aidan respectively, for a point apiece. Stefan’s was a particularly inspirational effort from the 45m line with his left foot. Although Maghery only won 5/9 of their restarts, 80% of these were converted to scores. A monster point from Oisin O’Neill brought his side back to within 4, converting 70% of their 10 shots. However from the resulting kick out Ben Crealey set up Stefan Forker for his third of the half while an Aidan Forker free left the 2 goals the difference. The score now Maghery 2-7 Crossmaglen 0-7. Crossmaglen got the next 2 scores. Rian O’Neill once more splitting the posts from a free kick to leave 5 the margin. Cross won the next kickout through Padraig Stuttard, who played in Paul Hughes. The defence began to open up as Hughes drove straight through the middle slipping the ball across the goal line to Stephen Kernan but he would have to settle for a point as he was forced to palm the ball over the bar. This settled the score at 2-7 to 9 in favour of Maghery at half time. Maghery’s primary source of scores came from winning their own kickouts, with 0-5 of their 2-7 coming as a result of this. They were able to win 8/13 of their own kickouts, 6 of which had been from break balls. 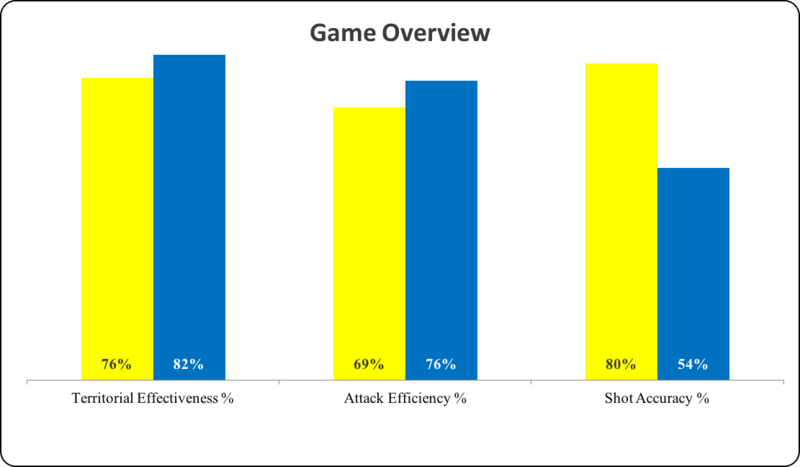 Their ability to get 13 shots out of 17 attacks served them well, as they converted 69% of these shots. Cross had fewer shots but a better return as they converted 75% of their 12 shots. From 15 attacks. Cross decided to carry the ball into Maghery’s defensive zone; 7/15 attacks coming as a result of carrying the ball forward. 5 out of their 9 points also came from play. Whilst Rian O’Neill (2) and Aaron Kernan (2) scored 100% of their sides shots from free kicks. An exciting and nervy second half was expected and in the opening 5 minutes that’s exactly what the crowd got. Maghery kicked 4 wides in a row, which may have put the game to bed. A much more physical and very motivated Cross side began to claw back Maghery’s lead; with Oisin O’Neill kicking 2 points before Stuttard kicked his second after a James Morgan turnover in defence produced a counter attack. It took Maghery until the 13th minute of the second half to register a score. Having kicked 5 wides during this period when Aidan Forker converted a free. Before another James Morgan turnover in his defence set up Stephen Kernan to score his second of the evening and to leave a 1 point margin. Cusack (Maghery) and Hughes (Cross) swapped points before two Maghery points from Crealey and another from man of the match Cusack gave their side a 3 point advantage. Paul McKeown then turned over a Maghery attack, leading to another Oisin O’Neill point. This now meant that all of Crossmaglen’s scores in the second half came from turnovers. Maghery extended the deficit to 3 once again, as Stefan Forker stroked over another free after a huge catch in the middle of the park by Ben Crealey. Cross kicked their first wide of the second half with 5 minutes remaining. However, the hard working Aaron Kernan who registered their next score with a pointed free kick. With the game in the balance, Maghery’s brilliance and determination shone through as substitute Paul Forker kicked his sides’ final point to leave the margin at 3. Crossmaglen failed to nudge themselves in front or get level in the second half. Maghery celebrated a 2-13 to 0-16 victory. 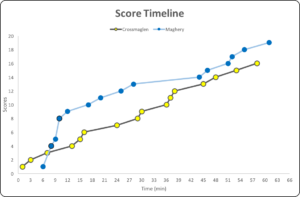 Maghery were able to retain 66% of their kickouts throughout the game, while also winning 12 of Crossmaglen’s 26 restarts. This meant that 10 of their 15 scores had come from winning restarts. They had 15 shots in the second half and converted 54 % of their chances throughout the game. Although Cross converted a huge 80% of their shots, they simply didn’t have enough shots to win the game. Out of 29 attacks, they had a total of 20 shots, kicking an incredible 4 wides throughout the match. While Crossmaglen only marginally won more of their own kickouts (14/26) this only provided them with 3 points. Their ability to counter-attack was their best scoring source, 7 of their scores coming as a result of turnovers. Maghery: Johnny Montgomery, Kevin Nugent, Oisin Lappin, Ciaran Higgins (0-1), Brendan Haveron, Stephen Cusack (1-2), David Lavery, James Lavery, Ben Crealey (0-1), Shea Tennyson, Conor Mackle, Ronan Lappin (1-0), Brian Fox, Stefan Forker (0-4), Aidan Forker (0-4). Subs: Seamus Forker for C. Mackle, Paul Forker (0-1) for B. Fox, Niall Forker for K. Nugent. Crossmaglen: Paul Hearty, Aidan Rushe, Rico Kelly, James Morgan, Aaron Kernan (0-3), Caolan Dillon, Paul Hughes (0-1), Stephen Morris, Stephen Finnegan, Paul McKeown, Oisin O’Neill (0-4), Stephen Kernan (0-2), Rian O’Neill (0-4), Padraig Stuttard (0-2), Kyle Carragher. Subs: Martin Aherne for C. Dillon, Johnny Hanratty for S. Finnegan, Tony Kernan for P. Stuttard.